Singer-songwriter Joe Henry’s career trajectory has been chameleonic: He started off rooted in alternative country before flirting with everything from meat-and-potatoes rock ‘n’ roll to tape loop-based trip-hop experimentalism. During the 2000s, however, it seemed he’d finally discovered his true voice, turning out an impressive string of darkly soulful albums which didn’t neatly fit any one genre but evoked many of the same feelings as the rickety, whiskey-soaked jazz-blues of Tom Waits. Twelfth album Reverie continues exploring this style, though the songs aren’t as cacophonous as those of his previous effort, 2009’s Blood from Stars, which often sounded on the cusp of total breakdown. 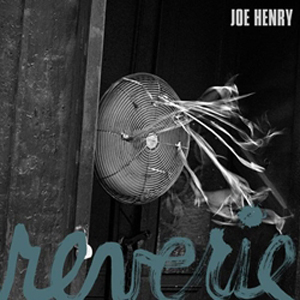 While there are still a few flickers of underlying chaos to be found, like the nervous drumming on “Sticks and Stones” and “Grand Street,” Reverie is Henry’s most stoic and mature offering to date, emphasizing above all else his aching, smoky vocals. Henry emotes with astonishing conviction throughout the album, marrying his sorrowful croon to classic, jazzy chord progressions and skeletal, mostly acoustic instrumentation, effortlessly hitting the blue notes and accidentals so crucial to early 20th-century vocal jazz. The music itself is certainly effective and at times downright chilling (check the bluesy Fleetwood Mac-esque pulse of “Dark Tears” or the ominous piano that drives “Strung”), but for the most part it functions as texture, a backdrop for Henry’s involved, imagistic lyrical tales of antiheroes and lost lovers as well as his emotional vocal delivery. “Tomorrow is October” and “After the War,” for instance, contain some of his most breathtaking lyrics to date, made all the more vivid by Henry’s incredibly emotional vocal delivery. If Reverie is united by one thing, it’s just that: emotion. Immersing yourself in Henry’s heart-on-sleeve honesty is eerily akin to peering into your own soul — a process by turns painful and rewarding. “Comfortable” still doesn’t quite describe Henry, who still weaves his dense storytelling among an ever-shifting amalgam of jazz, blues, folk, swing and even classical, but he does sound mellower — there’s no question the changes and nuances on Reverie, for all their arty sophistication, are calmer and subtler than past records. The album’s mood is also consistently dreary, and though it’s a wonderful soundtrack to a quiet, rainy night, it does rely a bit too heavily on languid, largely percussion-less ballads, while those which feature a full band are dirges or midtempo shuffles. As it’s not a wildly dynamic record, don’t put it on if you’re trying to stay awake on a long drive or expecting a flashy, stimulating listen, but Reverie is a poignant piece of careful introspection that reveals its sonic depth more successfully on headphones than over the car stereo and, if given the proper listening space it demands, it succeeds on its own terms.